H 60-80 ' & 2-4' in diameter. 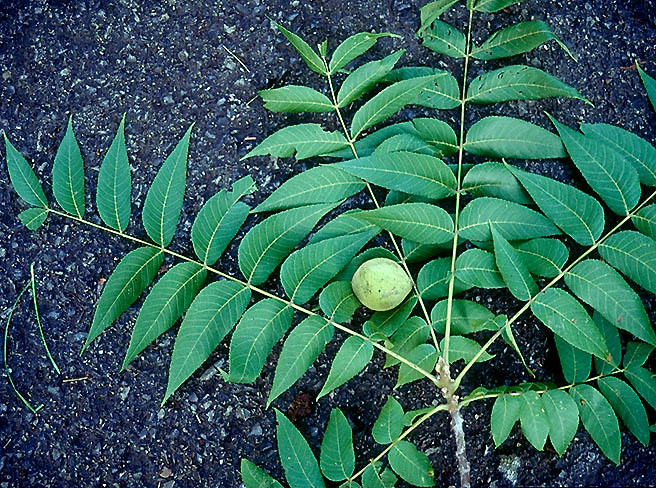 Black Walnut is a native nut tree of the eastern USA. Black walnuts have leaves that are compound, one to two feet long, with as many as 20 ovate leaflets; they are thin, bright yellow green above, somewhat downy and paler beneath, and turning yellow in autumn. male and female flowers, greenish catkins 3-5 inches long, occur on the same tree in May. The black walnut twigs are brownish and hairy, becoming darker and smooth; thick brownish or black on the trunk. The bark on a black walnut is a warm medium brown, very rough, with deep short perpendicular furrows. Black Walnuts can be grown in nearly all of the country from Florida to California and is hardy enough for most northern climates though it is rare east of Connecticut. It is really most happy in the loose gravely soil of stream banks in full sun and other undisturbed areas but tolerates alkaline and wet soil. Black walnut has a high tolerance for salt. Black Walnut is a tall majestic tree growing up to 75' in height and 3-4' in diameter but sometimes up to 8' in diameter in the Ohio valley. Walnuts develop a taproot which can make transplanting 6 foot or larger trees difficult. The 4 foot and under saplings transplant well. If growing Black Walnuts for transplant at a later time then you should check our root bags for ease of digging. Known mainly for it's sweet, edible nuts which are almost spherical, 1-3" in diameter or more; the husk is rough dotted dull green, the shell thick, the meat sweet, rich and oily. The simplest way to shell black walnut is to dump the nuts on a paved drive and allow the car to drive over the nuts till shelled. Remember the juice from the husks stains the hands brown! One of the most valuable timber trees of the eastern United States. Even one hundred years ago it was noted as becoming scarce so Black Walnut would be a wise investment for the future. It has been said that it takes at least 80 years to grow a black walnut to maturity for a saw log, I have a method of production that will shorten that time drastically, feel free to call for walnut growing tips. The black walnut wood is very durable in contact with the soil, deep brown, aromatic, hard, heavy, rather brittle and coarse grained used for veneer, interior finish, gun stocks and cabinet making. Black walnut weighs 38 lbs. per cubic foot. Black Walnut is an excellent choice for deer, turkey and squirrel feed. Nut production on a mature black walnut can be treemendous. Quite a few plants such as tomatoes, alfalfa, potatoes and some pines can be damaged by juglone, a toxic substance produced by Black Walnut. The Dawes Arboretum in Newark, Ohio says that, the following plants are not affected by juglone: Acer negundo, A. saccharum var. nigrum, A. saccharum, Asimina triloba, Betula nigra "Heritage', Celtis occidentalis, Cercis canadensis, Cornus florida, Euonymus europaea, E. hamiltoniana, Halesia carolina, Kerria japonica, Koelreuteria paniculata, Liquidambar styraciflua, Lonicera maackia, L. tatarica, L. xylosteum, Picea abies, Pinus jeffreyi, Platanus occidentalis, Prunus serotina, Pyrus calleryana, Quercus, alba, Q. imbricaria, Q. rubra, Sambucus canadensis, Thuja occidentalis, Tilia platyphyllos, Tsuga canadensis, Viburnum lantana. For more information on growing black walnuts see U of M.
There is a new quarantine issued by the Michigan Department of Agriculture concerning importation of Black Walnut wood, stumps, branches and seedlings from the west coast because of the Thousand Canker Disease. This pest operates much like the Dutch elm disease. It is currently known to be in Arizona, California, Colorado, Idaho, Nevada, New Mexico, Oregon and Washington. For more information go to www.michigan.gov/mda. 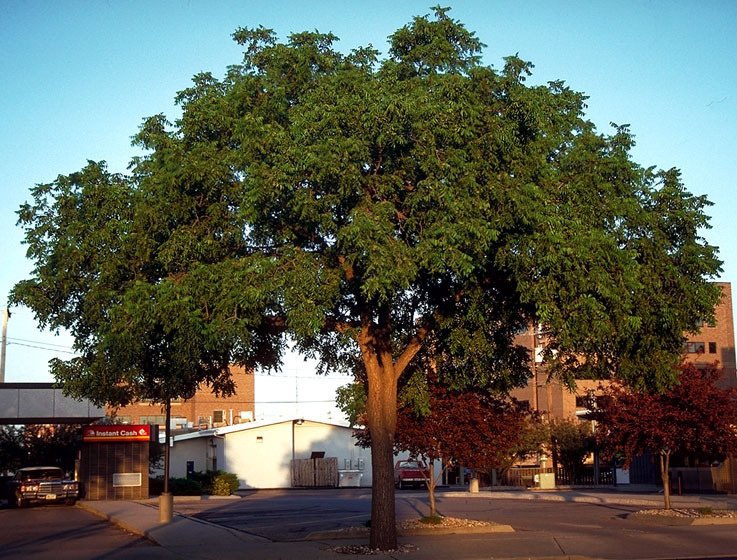 Black Walnut trees can be messy with the large compound leaves and nut drop. To buy Black walnut seedlings and transplants use the table below. Check out our other nut trees. Order Black Walnut seedlings by PHONE: We're glad to take your order by phone @ 231-544-6769. Phone orders can be charged to VISA, or MasterCard accounts.